slice the bread. remember, a crostini is typically made from a baguette of some kind so you can maintain that beautiful plate-like disk. i like to slice at a diagonal to maximize the surface area and give a little bit more of slender, elegant look to my appetizers. slice as thin as you possibly can. the goal is to make a slice thin enough that it can be consumed without tearing at, but thick enough that it doesn’t burn up in the oven. give them a quick toast on high temperature, maybe only two or three minutes. be careful, make sure to watch them while they are in the oven. cut the ends off of an onion and remove the peel. cut the onion in half and remove the core (especially if it looks green or yellow). place the flat side on the cutting board and cut slices thin enough to be transparent. split the avocado. whack the blade of your knife into the pit and give a quick twist in one direction and it should come out without damaging the flesh at all. remove the skin from the avocado and cut diagonally into the flesh to create nice, thin, long slices. remove your smoked salmon from its packaging. do your best not to use canned smoked salmon, mainly because its grainy texture leaves something to be desired. 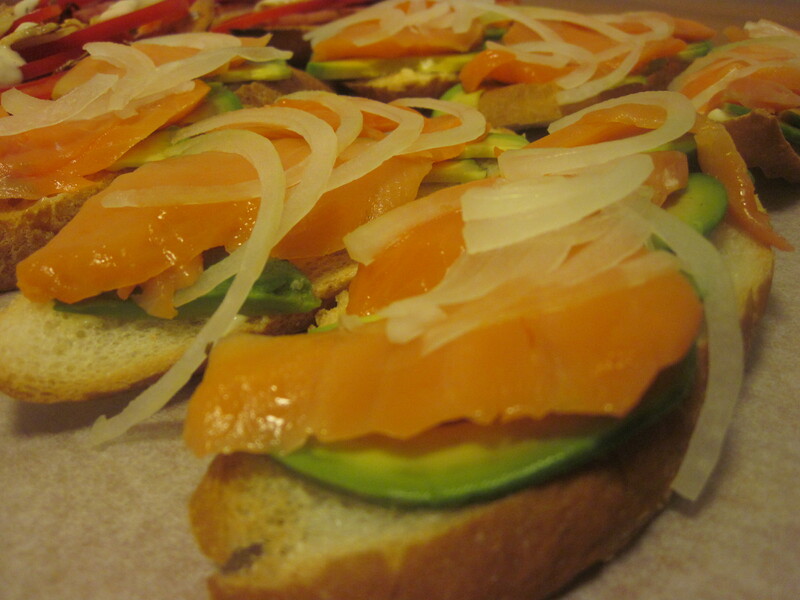 dry smoked and wet smoked salmon are both ok, but for this particular you should be looking for something akin to lox. assemble. add avocado, smoked salmon, and onion in that order to the disks of toast.